The STEM Education Coalition recognizes the important role that the media plays in promoting STEM Education. It is crucial that people are aware of the importance of educating and preparing America's workforce for the challenges of tomorrow. In step with our core principals, the Coalition publishes a weekly newsletter. Please be sure to sign up to receive your copy. 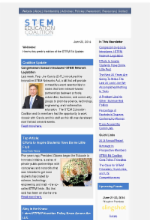 The STEM Education Coalition has archived all of it's past weekly newsletters for your reference. For older articles, see Archived News.